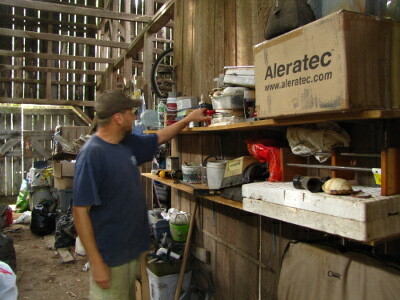 While I've been playing in the garden and Bradley's been building things, Mark has faced the most difficult job on the farm --- organizing the barn. I believe in being honest on our blog, but sometimes you just don't need to see the worst case scenario. So there are no before photos that go with this post. 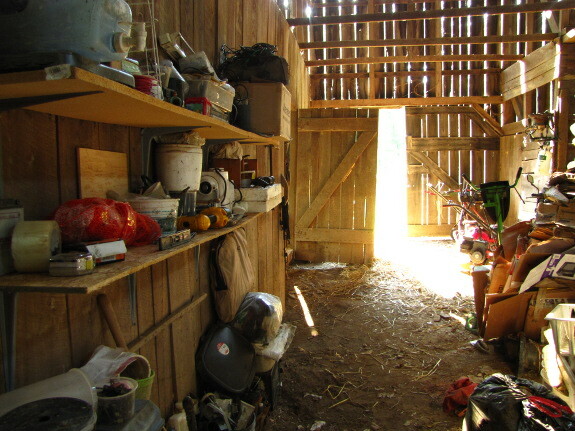 Suffice it to say that for five years, only a small portion of the barn was waterproof, and that area had no solid walls on which to hang shelves and tools. 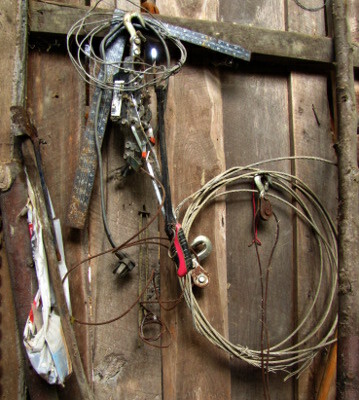 As a result, everything in the barn was piled in a mass right in front of the doors. A new roof opened up exciting barn area, but didn't do anything about the jumble of machinery, tools, and so forth that had built up in the aisle. For the last few weeks, Mark has been dealing with years of neglect, which mostly consists of putting things on shelves and nails. I'd say he's about halfway done (or maybe even more), with the result that we can walk into the barn again! The long term goal is to have room to stable the golf cart and lawn mower in a nearly clear central aisle, with the sides being split up into work and storage areas. We may eventually build lofts too, either just for fun, for guest quarters, or for biomass stockpiling (aka hay lofts). There's certainly plenty of vertical area to take advantage of in this old tobacco-drying barn. I just thought you should know why Mark's been quiet about his projects lately --- he's been slaving away on an unphotogenic task that no one else wants to tackle. Thanks, honey, for perservering! Our chicken waterer keeps the coop dry so you and your hens are happy. I've never had to store everything in one spot, but trying to keep our garage organized has been a constant task. I'm not quite sure why that is either... A couple of months ago I went through and organized all kinds of stuff, got rid of even more, and made enough room to actually use the garage again. It had been needed for a good year or more. The barn is looking good! Chris --- Yeah, I'm not quite sure how the buildup happened here either. It sure is easy to let that get out of hand! Hopefully adding lots and lots of shelves will at least keep the issue in check. Great Work- So much satisfaction from work that keeps on paying you back! Jayne --- I agree! Especially since I get to enjoy it without doing the work.